Some might remember Uncle Ralph, the cool looking gentleman with the pretty large Stetson, you know who I mean? A while back I got an e-mail from an US gentleman, Jim A. from Tucson AZ. His e-mail was quite interesting as he claimed to recognise Uncle Ralph as Chuck Binney whom wich Jim worked with at UCLA in the late sixties. Chuck had been a dedicated motorcyclist in his younger years staying faithful to the Harley brand, as well as young Chuck was carefull in his choise of costume (with regards to his Stetson this is an understatement). I had to admit that my Uncle Ralph and the entire story including Ralphs name was a product of my imagination, that Ralph might well be Chuck or the other way around. 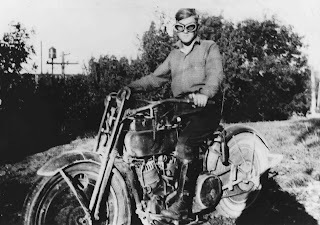 OK, if or not here is an image of a young Chuck Binney and his 1918-19 Harley, as with his later bike shown in the akà Ralph post this bike too is fitted with artillery wheel caps to prevent mud getting stuck in the spokes. This was quite common during the WWI years. Cuck have a Harley pennant attached to his handlebars, I wonder why did this fashion get to an end. I would love to ride with a Harley / AMcN pennant on my handlebars. Jim thanks for letting us getting known to Chuck. Take care when out for a spin with your Velocette. there is an interesting article in the latest VMCC Journal about spoke covers and other aftermarket items that were fitted to bikes in the 19teens and 1920s. It basically said that all things were a fad, and went away pretty quickly. check it out. I think the wheel covers thing where an idea to prevent mud from getting stuck in the wheels due to muddy gravel roads, wich in itself is no bad idea. Along the way road quality became better and the need for wheel covers became less. I personally find those wheel covers a cool addition to those period bikes.